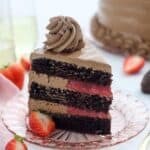 This Chocolate Strawberry Cake is a moist chocolate layer cake with a strawberry filling and it’s covered in a chocolate Swiss meringue buttercream. Garnish with chocolate covered strawberries if desired. Right before we left for our honeymoon I went on a rampage making allll the chocolate cakes and in one weekend I had 3 different chocolate cakes in my house. Maaaybe not the best idea right before you leave for a 2-week vacation, but can you blame me? This Chocolate Strawberry Cake is layers of moist chocolate cake with a fresh strawberry filling and finished with a chocolate Swiss meringue buttercream. 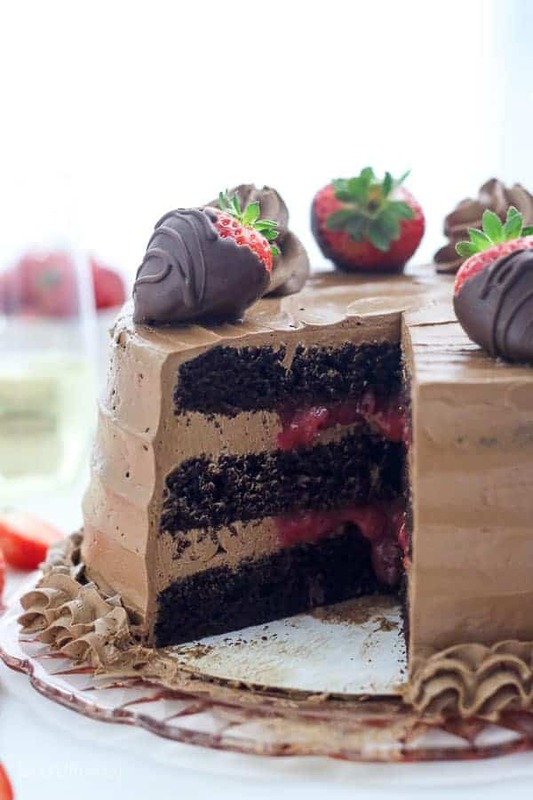 Plus there’s some chocolate covered strawberries on top to! With Valentine’s day approaching, I knew I wanted to make something with chocolate covered strawberries. 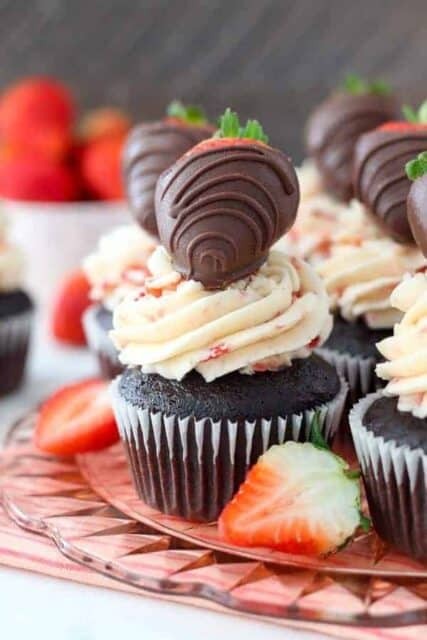 My husband usually orders these for my for Valentine’s day because he knows they’re my favorite treat. They feel like the healthiest chocolate option, am I right? 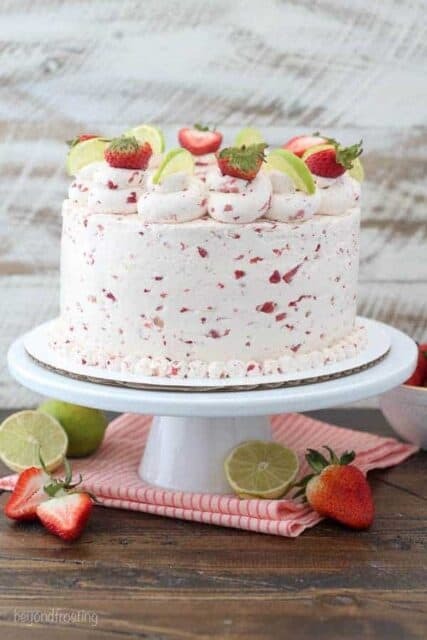 To be honest you don’t really need the strawberries on top but why would you not just make them anyway since you have to get strawberries for the filling? I always make extra so I have some to eat. I only put 4 of them on the cake, but you could certainly add more. Below I give a brief explanation about how to make chocolate covered strawberries. Okay so you’ve seen the chocolate cake recipe before. It’s a 3 layer 8-inch cake made with simple ingredients. It’s fluffy and amazing and it’s super moist because I add sour cream to the batter. It will become your go-to chocolate cake recipe. You’ve also seen the strawberry filling before. I’ve made a few variations of it, but most notably for the Strawberry Mascarpone Cake. The filling is also quite easy to make but it can be sometimes feel like it’s not thick enough. Maybe it didn’t boil long enough or maybe your strawberries were a little more wet, and thus need additional flour. It’s okay to add additional flour if the sauce isn’t thickening, but this can only be done while it’s still hot. 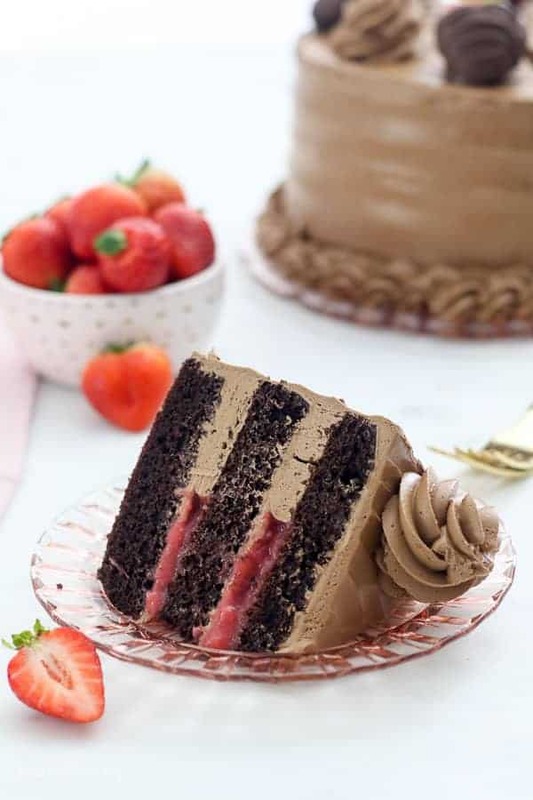 When it’s time to add the filling to your cake, you will first make a dam around the outside edge with the frosting, so that the filling doesn’t seep out the sides of your cake. I went a little heavy with my dam, which is why it looks like there’s so much filling in the middle of the cake. You probably don’t need to be quite as cautious. 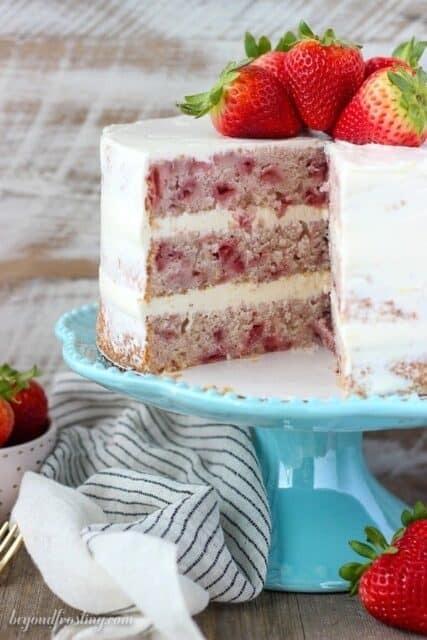 The strawberry filling is pretty sweet, but it’s a perfect balance because the cake isn’t overly sweet nor is the frosting. The best bites are the ones that have all 3 elements! Now there are quite a few steps to making this cake, but I like to do it in stages. 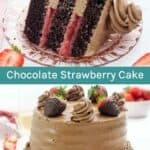 I make the cake and the strawberry filling first. Then I make the frosting the next day and assemble. The results are WORTH IT! For the chocolate, use chocolate wafers that are meant for candy making. My favorite are from Ghirardelli. Place on a piece of parchment paper to dry. First, I cut the strawberries into small pieces and then I gently puree them with a food processor. Sprinkle the sugar and flour over the strawberries and add some lemon juice. Cook the strawberries over medium heat until they thicken. It’s important to add just the right amount of flour. Too little flour, and the puree will be too thin, but too much flour might make it a little too thick for you. So, use your best judgement, and start with one tablespoon of flour and if your puree doesn’t thicken, you can add some additional flour, up to one additional tablespoon. I have an entire post dedicated to how to make Swiss meringue buttercream, and it’s worth the read if this is your first time making this frosting. I find it’s best to use a high-quality chocolate bar for this frosting. 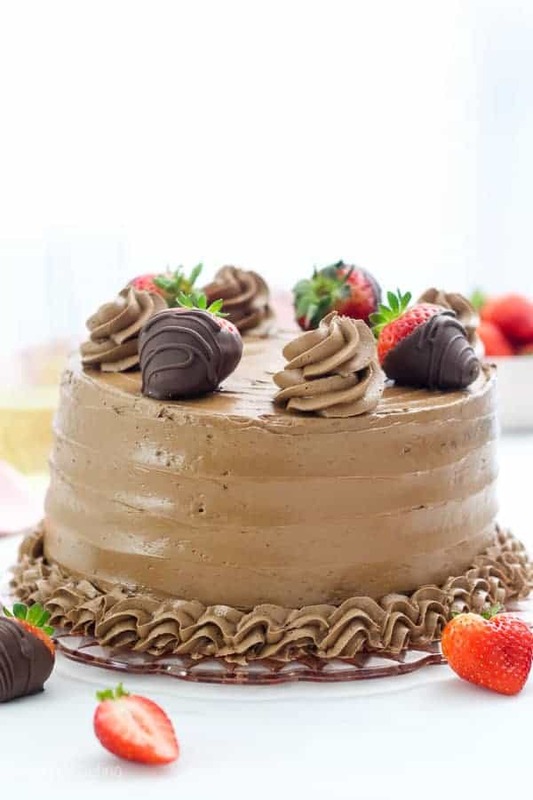 The flavor of this frosting is entirely from your chocolate. While I prefer dark chocolate, milk chocolate would work fine to. I’ve never made it with chocolate chips simply because chocolate chips are coated to prevent them from melting at high temperatures and often it produces a more oily consistency when melted. Melt the chocolate after you start to beat your egg whites in the mixer, this will allow time for it to cool. I recommend microwaving it at 50% power, so it does not burn or sieze. I always recommend using a candy thermometer when heating the egg whites. You can buy them at Target for $10. You need to cook the egg whites and sugar to 140°F – 160°F and the candy thermometer is of course helpful for that. As the butter is added, the meringue starts to lose its shape and it will start to look curdled. That’s okay! Once all the butter has been added, switch to the paddle attachment. 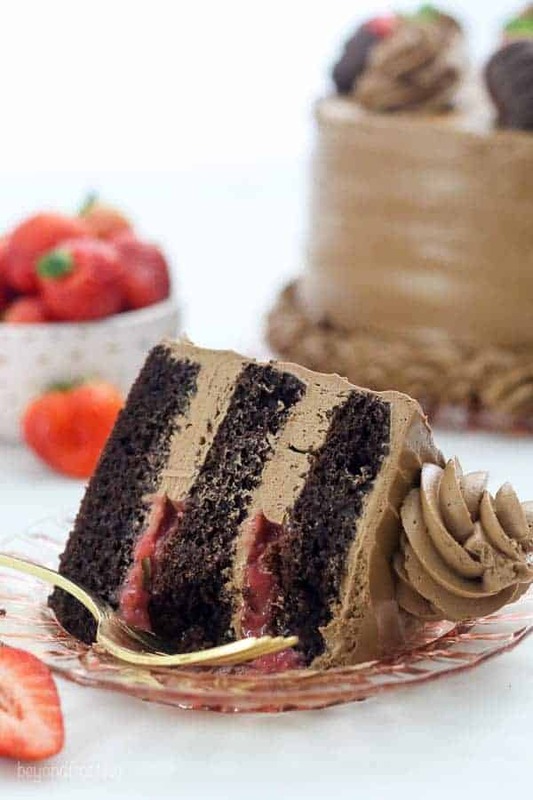 Continue beating the frosting and it will eventually come back together and into a silky-smooth texture. As this is happening, you’ll add the cooled, melted chocolate. 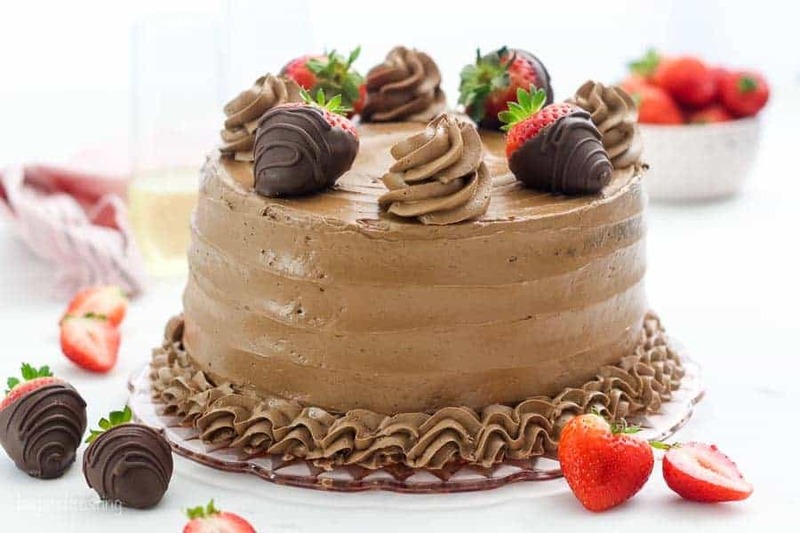 If you feel that your buttercream is too runny, throw it in the refrigerator for 15-20 minutes and then rewhip it with the paddle attachment. You’ll have more than enough frosting to make this cake. This cake should not be refrigerated. Since the frosting has a high butter content, it will harden to a solid state if left in the refrigerator. 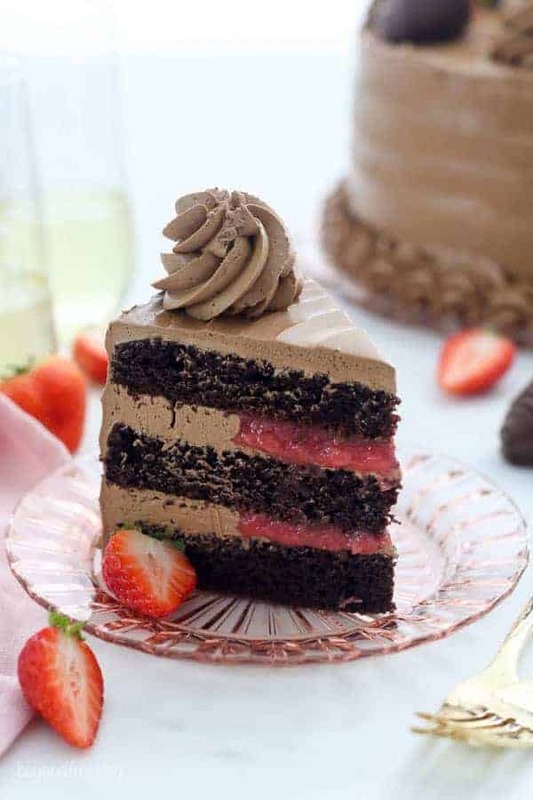 You don’t need a special occasion to make this Chocolate Strawberry Cake! 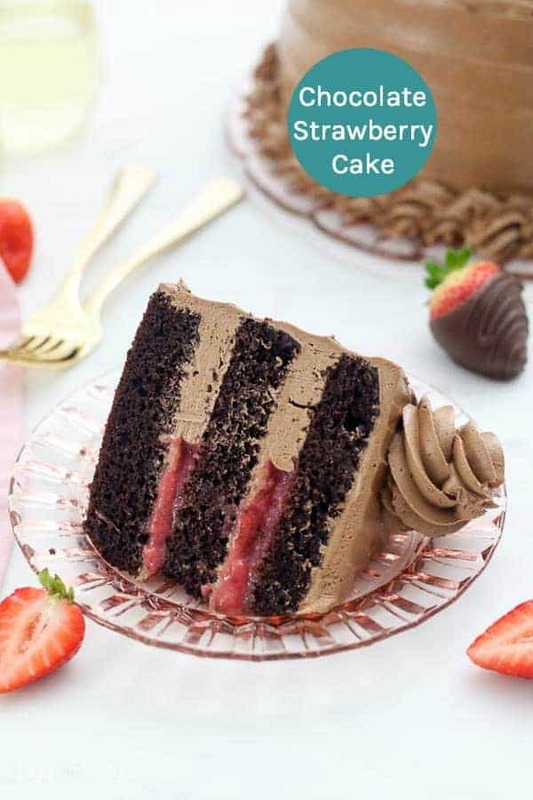 Any idea how long the cake stay without the strawberry filling making it soggy? Hi Carol, 3-4 days is usually fine. Looks beautiful — and delicious! But please proofread. I don’t think you meant to make a “heavy DAMN,” lol. I actually meant heavy “dam”, so without the n. And as much time as I spend reading post, a spelling error here and there is bound to happen. Thanks for pointing it out so I could fix it! Have a great day. Recipe says white chocolate but description says chocolate?